During the Mac’s Food Market last Sunday I went with some friends to try out The Vegan Grindhouse‘s burgers. The Vegan Grindhouse doesn’t have a restaurant, but tours round food markets and events instead. They offer a variety of vegan American-style burgers, ‘chicken’ and ‘beef’. All burgers come with a side of BBQ baked beans or coleslaw. The promise of proper Vegan American-style food had already been siren-calling me for some weeks, so I was very excited to chomp down on one of their burgers. I choose the Mexican Stand Off, a quarter pounder served in a sesame seed bun with “cheese”, guacamole, salsa, red onion, jalapeños and sour “cream” and a side of coleslaw. The burgers were delicious and disappeared very quickly once we had found a place to sit in the busy Mac. We thought the price was fair for the amount and quality of the food. Our only comment was that the BBQ baked beans tasted very much like normal beans. 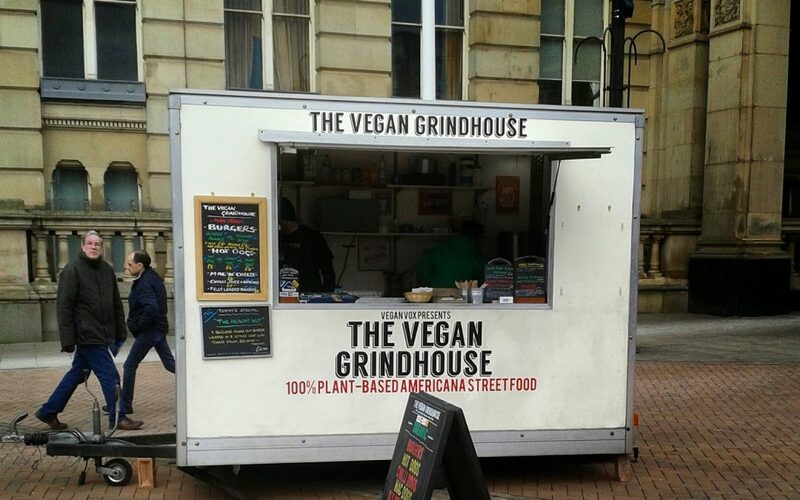 Check the Vegan Grindhouse’s Facebook page to see where they will pop-up next.